Velmayil Cultural Mahall is a part of Velmayil Group of Companies. 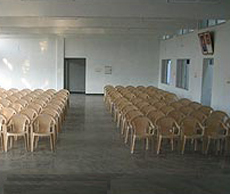 Velmayil Cultural Mahall is a modern day marriage hall with roof garden, conference hall and lecture hall. The cultural mahall established in 2004 promotes cultural activities, social events, and conducts music and vedic classes. Velmayil Cultural Mahall is located in Vadavalli, a fast developing part of Coimbatore. The mandapam is located en route to the Maruthamalai Murugan Temple, in Vadavalli amidst the Western Ghats. The ambience of the location pleases everyone with its lush green environment. The pleasant surrounding is best suited for all marriage and other get-togethers. The Cultural Mahall consist of KURINJI hall and MARUDHAM hall.Vinayagar temple is located very near to the mandapam for rituals during marriage. The total area of the Mahall sprawls over a 12,800 sq.ft with four spacious floors each dedicated to Marriage hall, conference hall, dining hall, roof garden and lecture hall. Every floor is well lit with natural light. 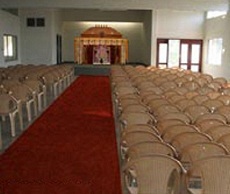 The marriage hall has rooms for bride and bride-groom parties. 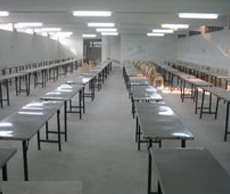 The capacity of the dining hall is around 300 persons. The dining hall also has a well equipped kitchen with both steam heated and gas heated . The conference hall has the state-of-the-art acoustics and conducive ambience for organizing conferences and board meetings. The roof garden is being used for birth day parties, anniversary parties, and other. 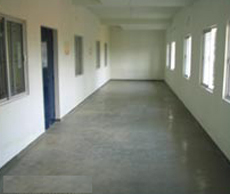 The building is well maintained by the management and is provided with lift facility. Our efficient service also includes 24 hours back–up facility of electricity with generators and also 24 hour water supply through bore well. Velmayil Cultural Mahall is a part of Velmayil Group of Companies. Velmayil Cultural Mahall is a modern day marriage hall with roof garden & conference hall.